Yesterday, I harvested our first perfect, adorable yellow crookneck squash. Isn't it the cutest thing ever? While I'm thrilled to think about the deliciousness of lightly sauteéd squash with a hint of Parmesan melted on top, I'm also a bit nervous. Last year, our first good harvest of squash was also our last harvest. Squash vine borers invaded the garden. This season, a gardening friend of mine already reported that he's lost a zucchini vine to the evil beasts. They're rampant, invasive, highly destructive. One day, you're harvesting lovely squash for a delicious ratatouille--the next, your vines are wilting. You think your forgot to water the bed--but no. Instead, your perfectly tended vines are being eaten from the inside out. It's like a horror movie.
) tunnel into stems of the squash plants, feeding on the basal portion of vine--which kills the plant. Sometimes, the borers venture to the fruit. Squash vine borers mature into a moth known as a "clear wing," due to the lack of scales on the hind wings. 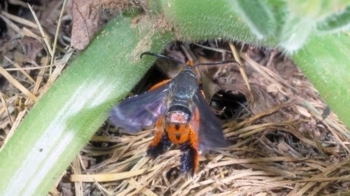 The moths are often mistaken for wasps, as they fly during the day, laying eggs on the leaves of cucurbits. The larvae are white, thick, and more than an inch in length when fully grown. The biggest challenge for those of us in warm climates is that these nasty borers emerge early. The insects overwinter in the soil in the form of a larva or pupa, emerge in early summer, and lay eggs on the stems of the plants--typically in late May. The larvae hatch, bore into the vines, and complete their development in about four weeks. After they wreck havoc on our crooknecks and zucchini, they crawl into the soil, spin a cocoon, and transform into a pupa. Have I mentioned how much I hate these nasty borers? A friend of mine who is a fairly new gardener but a talented, crafty kind of girl tried to grow pumpkins with her kids last year. She thought it would be a great experience for the family to grow their own pumpkins, harvest them, and then carve them for Halloween. The killers not only of vines--but of gardening dreams. When she asked what she could do to save the vines--I didn't have any answers. But now, I've done my homework. This year, before planting the raised beds, I researched every type of companion plant to help the garden flourish. Interestingly, I found that icicle radishes, planted in the same mounds as cucurbits and allowed to flower, are used as a trap crop for squash vine borers. Now, planted among all of the squash, zucchini, and cucumbers, the leaves of icicle radishes peek through. I'm crossing my fingers that it works. 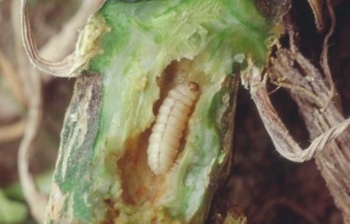 As a preventative, crop rotation is important to avoid the nasty borers. Because the larvae overwinter in the soil, avoid planting any members of the cucurbit family in the same location each year. (Cucumber, squash, and melon comprise the cucurbit family.) Also, destroy any vines killed by the borers to break the life cycle. Additionally, you can help prevent infestations by installing row covers over the crops--but then you'll need to hand pollinate your vines. , you can slit the infested vine lengthwise and remove the borers with a long needle. (Kind of disgusting, but still--you have dinner plans for that yummy squash, right?) After you've removed and destroyed the invaders, heap soil over the slit stem to encourage rooting. win the battle against these beasts. Who's with me? !